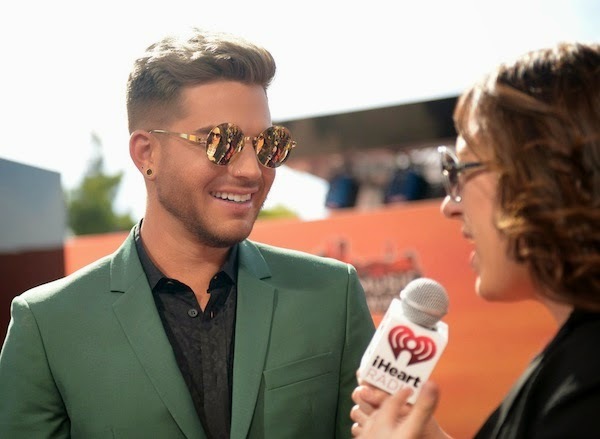 Adam Lambert attended the 2014 iHeartRadio Music Awards held at The Shrine Auditorium on 1 May 2014 in Los Angeles, California. Adam Lambert wore a green suit from Kris Van Assche Spring Summer 2014, over a black Saint Laurent leopard print shirt. He accessorised with a gorgeous pair of round framed mirrored sunglasses, matching black patent leather Versace platform loafers and various rings from Vivienne Westwood and Topman. The interesting detail about Adam Lambert's Kris Van Assche suit: it has two snap buttons at the front. Love the cropped proportions which fitted him well. The Saint Laurent baby cat / leopard print shirt was a nice touch, with the pattern shimmering through under the sun (i.e. not just a black shirt). Great effort to pair the gold mirrored sunglasses (#NEEDNOW) to the Versace patent leather shoes with gold mirrored plating too. Even his hair colour is lightened to match the golden accessories, effort! It was a very well coordinated effort for Adam Lambert at this event, keeping the colour scheme to mainly green, black and gold. Love his Topman x Stooki ring, which I have lusted for a VERY long time. The gold Vivienne Westwood skull ring is equally stunning. Well played Adam Lambert, well played. Adam has got awesome tastes and style! Any idea what's the sunglasses's brand ? no idea i'm sorry, trying to find out myself! Can't find a thing online about these sunglasses! I want them so bad..